Published: Aug. 30, 2011 at 01:43 p.m. 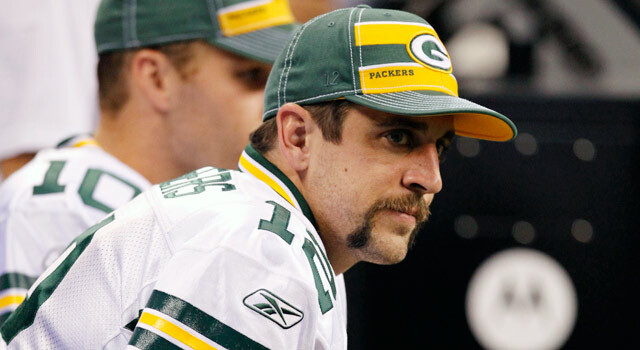 This mustache should inspire a better nickname than A-Rod. We, as Americans, owe Aaron Rodgers that. America has become lazy. And you do not need to troll around the typical Walmart in St. Louis to see this. The biggest evidence is in the nicknames we have bestowed upon players. Our NFL heroes used to have nicknames like Night Train, Sweetness or Bronko. Now we just use initials or hyphens. Where is the America that I used to know! And what is worse, we have given some of the greatest nicknames to guys who have done nothing to deserve them. We have to stop this. So here is a list of the six worst nicknames and better suggestions. Understandable that the Jets have been clamoring for a franchise quarterback since Joe Namath (or, if you are really generous, Richard Todd). But labeling Mark Sanchez as the "Sanchize" might be a bit much, especially when you consider that he has not even passed Ken O'Brien in Jets lore. Shawne Merriman inspired a rule that no player who tests positive for a banned substance should be allowed to play in the Pro Bowl or win any awards that season. The jurisdiction of that rule should be extended to include self-aggrandizing nicknames, too. Forgive me for quoting Fergie, but this nickname isn't 2008, it is 2000 and late. A more appropriate nickname might be CJ 1300. But he has earned a pretty cool nickname, one that is more timely. Matt Ryan has seemingly been kissed into NFL superstardom since he first arrived in Atlanta, including earning a rather cool nickname. Almost too cool for a guy who absolutely (expletive) the bed against the Packers in the playoffs last season. Well, it is one thing to snag the nickname of a somewhat obscure player and make it your own -- even though that is still wrong. But when you rip off the moniker of one of the greatest players in NFL history, that people, is an outrage. How is it that the league's top player, the face of the NFL (at least according to jersey sales ), has the same nickname of the most vilified player in Major League Baseball, Alex Rodriguez? How is the top sport in the land using baseball nicknames? That is egregious. You know who needs a cool nickname -- Rank. Send him one via Twitter or via Facebook. Be sure to catch the latest on the Dave Dameshek Football Program. "Six people you meet at your fantasy draft..."